Cristin is thrilled to be an invited author for her third Texas Book Festival! Cristin will be participating in two panels and signings, both on Sunday Oct 28. At 11:30am, Cristin will be a part of the EVERLASTING LIFE: WRITING THROUGH GRIEF panel with The Baltimore Book of the Dead author Marion Winik. And then at 2:30pm, Cristin will be a part of the POETRY OUT LOUD: PERFORMING VERSE panel with fellow poets Daniel Garcia Ordaz and Jasminne Mendez. Book signings at the Book People tent will follow each panel. For more information on these panels, as well as all the other wonderful Texas Book Festival events, click here. 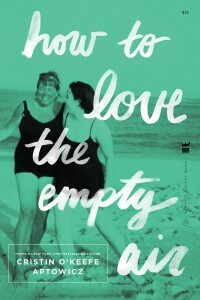 “Cristin O’Keefe Aptowicz’s stunning book of poetry, HOW TO LOVE THE EMPTY AIR, explores great loss at the height of great success and how we cope not only with the unexpected absence of a life, but also with the endured memories of death,” begins the rave review by writer Amber Tamblyn in the August 2018 issue of Bust Magazine. “Aptowicz writes about losing her mother very suddenly while her personal and writing lives are flourishing—an experience that left her at once devastated and illuminated, reeling from shock and relinquishing herself to the tenderness of new love. These heart-cracking poems humble and haunt the reader, reminding us that with every fall life hands us, a rise awaits us on the other side.” To read the full review, please click here. HOW TO LOVE THE EMPTY AIR East Coast Events announced! Cristin is thrilled to be returning to one of her favorite bookstores on the planet, The Strand in New York City. Cristin will be debuting new poets from her book HOW TO LOVE THE EMPTY EMPTY and will be sharing the stage with old friend & brilliant poet Sarah Kay who will be reading poems from her various collections, including the just released ALL OUR WILD WONDER. For more information, please visit The Strand website here. A Write Bloody LIVE Event where Cristin will be sharing the stage with Sarah Kay (All Our Wild Wonder), Anis Mojgani (In the Pockets of Small Gods) and Derrick Brown (Hello. It Doesn’t Matter). See these wonders perform, and then stick around to snag copies of their brand new book. For more information, visit the PhilaMoca website here. A Write Bloody LIVE Event where Cristin will be sharing the stage with Sarah Kay (All Our Wild Wonder), Anis Mojgani (In the Pockets of Small Gods) and Derrick Brown (Hello. It Doesn’t Matter). See these wonders perform, and then stick around to snag copies of their brand new book. For more information, visit the Union Stage website here. 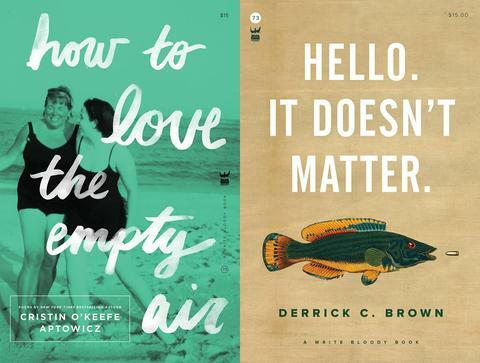 Cristin’s seventh collection of poetry, How to Love the Empty Air, is being released March 20th, and Cristin will be celebrating with a week of book events with her friend, publisher & fellow poet Derrick C. Brown (whose latest collection, Hello. It Doesn’t Matter., will be released on March 20th too! Cristin O’Keefe Aptowicz and Derrick C. Brown will be reading from their brand new books of poetry for the first time! Come snag a copy of their books on the day they come out! With special guests Jessica Abughattas and Write Bloody’s Jackson Burgess! Free show! Cristin O’Keefe Aptowicz and Derrick C. Brown reading from their brand new books of poetry! With special guest, poet Micah Bournes! Free show! Cristin O’Keefe Aptowicz and Derrick C. Brown will be reading from their brand new books of poetry. With special guests, poets Bethany Toews and Tonya Ingram! Free show! Cristin O’Keefe Aptowicz and Derrick C. Brown will not only be reading from their brand new books of poetry and discussing the inspiration behind their works, but this event will be recorded for the 1888 Center’s podcast “Writers Block Live!” which will be available at 1888 Center’s website 2-3 weeks following the event. Free show! Cristin is thrilled to be performing at Derrick C. Brown’s official release extravaganza for his new book of poetry Hello. It Doesn’t Matter. This event will feature Derrick, as well Jacqueline Suskin, and sharer of a great name: poet Derek D. Brown. Musical guests Cardioid and Jimmy Von Eps will also perform. This event includes a complimentary beer tasting / home brewer’s competition, featuring five home brewers competing for the title of Brewmaster. Also, there will probably be a dance party. Just because.